10) Pena's turtleneck doesn't have enough folds. 9) It blinded the judges who could have deemed it "Classic"
8) The design set the Photoshop world back 11 years. 7) They had to kill four tigers to make the borders for the full set. 6) Pena's facial hair got the company sued by the makers of "The Three Musketeers." 5) It doesn't feature Pena's autograph even though he's signing an autograph. 4) Pena's tuck job looks a little forced. 3) It's not yellow enough. 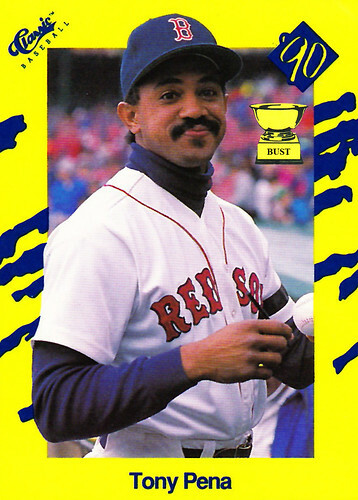 2) It's a Tony Pena card. 1) It's a Classic card.